Suppliers, we'll contact the Category Manager of your customer which you can recommend anonymously. Carriers, we'll do the same with your shippers. This past week I got to sit down and interview an industry leader who has defined what collaborative sourcing is when he first created the system at Bristol-Myers Squibb 15 years ago. Jeff Ryan of Bravosolution, a previous contributor to the GTBP.org, teaches his clients, which include industry leaders (BASF, Campbell's, Con-Way, FedEx, IBM, International Paper, Johnson & Johnson, Sara Lee, Scotts, Tyco, Unilever), how to get to the next level of collaborative savings after ‘blood-letting' suppliers on price based auctions. He believes that a variety of non-price criteria need to be considered alongside price to achieve long-lasting relationships beneficial to both parties. If you click on the link at the bottom, you can recommend a customer who you think might be in need of an education. GTBP: Jeff, first of all what is Basic Sourcing? 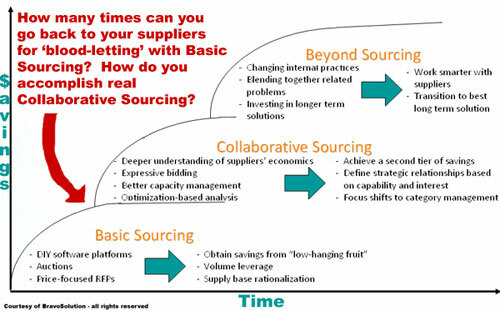 Many times when I walk into a company and they tell me that they are using collaborative sourcing; I try and peg them to see where they are in the above sourcing evolution. If they start using terms like, "We just started using sourcing for the first time across all of our business units to obtain savings from the low hanging fruit. We have $10MM of spend in this category going to 300 suppliers and we are trying to rationalize that down." Then that tells me that they are probably using and should be using a do-it-yourself auction software platform such as our XE platform or those from Ariba or Emptoris. They are simple price focused RFP platforms that will save them a pile of money. This is not Collaborative Sourcing. At this point, we call this Basic Sourcing, and most companies need to operate at this level for at least a couple of years before they are ready to take the next step to Collaborative Sourcing. GTBP: What would cause a company to go beyond Basic Sourcing? After a couple of rounds of re-compiling RFPs, leveraging your volume, taking the low hanging fruit, and beating your suppliers up on price with auction software, the savings begin to plateau. The pool of suppliers is smaller and the category manager still needs to perform on cost. They have already applied Basic Sourcing to the MRO, facilities, packaging, and shipping suppliers. Where is he going to find the savings? This is where Collaborative Sourcing is ready to be used. The other area that Collaborative Sourcing could be engaged is with mission critical suppliers. With these suppliers simple Basic Sourcing would not work because you would end up with a low cost supplier in a third world country, shipping work-in-progress materials from one end of the continent to the other and put your corporation at more risk than the savings is worth. GTBP: Okay, what is Collaborative Sourcing? 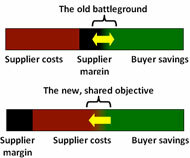 Collaborative Sourcing is fundamentally a process of collecting detailed information on your supplier base, allowing them to create custom bids where they believe they could offer the most value to the customer, and having a large analytical engine to overlay all of the information, bids, and scenarios to map out the strategic savings. Let me give you one simplified example. In the Basic Sourcing model, a Category Manager might slice up the facilities management category into a lot of little pieces; like housekeeping, building maintenance, lawn mowing, and cafeteria services, and auction off the pieces to suppliers. But then one supplier might come forward and say, "You never give me an opportunity to bid on multiple auctions, and if I could win six of these pieces, then I could offer a killer price." Another supplier might want to bid on all of the pieces but only for a certain region that he is located. While yet another might want to just do one task but could do it for the most competitive rate if he could perform the task nationwide. In this case the Category Manager wants to slice it up and have companies bid by piece and in return the suppliers want to give custom bids. The Category Manager just does not have a vehicle to manage and analyze how the multiple custom bids would best suit his company. That is what Bravosolution Collaborative Sourcing tools do. We entertain the disparate bids from the suppliers. We don't tell them how to bid, but we can structure it for the customer. So one guy can bid on his six tasks, the nationwide guy can bid on his single task, the regional supplier can bid on their region, and the Bravo system puts the best solution together for the client. The Bravosolution Collaborative Sourcing analytic engine offers multiple scenario generators. It is not uncommon for the ‘What if' generator to offer 200 scenarios for a big nasty problem because you are looking for a solution that fits your business, makes your stakeholders feel comfortable and saves you a pile of money. GTBP: I assume that this is web based to offer easy access for suppliers to input their information, respond to the requests and feed the engine without the need for manual re-keying of data. What type of information are you collecting? It depends on the category, but detailed information on everything from distribution to capacity, to the types of machines used, and where they are located. The more detailed the information is that is collected the more strategic opportunities can be discovered using the analytic engine. GTBP: Doesn't Big ERP systems like SAP and Oracle allow for supplier custom bidding and scenario generation. No it does not. Our best clients are the ones that had to try and make due with limited sourcing software solutions that their IT department brought in and asked all category managers to use. We are dealing with clients that are unhappy with the internal software and support. There is nothing on the market that is close to the Bravo service that we provide today. GTBP: Who are your best clients? Who brings you into an organization? Our clients are billion dollar corporations spending more than $10MM per category. The person who bring us into an organization and request funding are the Directors who manage the Category Managers. GTBP: What is your revenue model? How do you charge? They pay for what they use. Time and materials per project. After the first project, the client can use the solution with less consulting services to set up the process with the next category. Some clients use the solution as an ongoing category management system. The solution is offered in a SaaS (software as a service) model. This makes it easy for the director and manager to select and use the system. It does not require internal IT resources. GTBP: Jeff, thank you for your time. You mentioned that you have a special offer for the readers of the Global Trade Best Practices Org. If you are stuck in the Basic Sourcing model with your BIG billion dollar client/shipper/buyer, and you believe that you could offer them more business, in a strategic integrated manner, click on the following link and fill in your buyers contact information. You can do it anonymously but provide some helpful conversation starter information, and I'll do what I can to put a Collaborative Sourcing system in place.